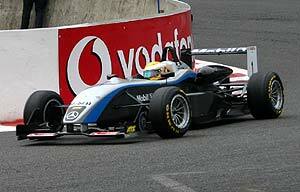 Following his disqualification regarding yesterdays race, Lewis Hamilton (ASM F3, Dallara-Mercedes) succeeded in securing his fourth win of the season, today, in the sixth 2005 Formula 3 Euro Series round. At the Belgian GP circuit, the 6.968-kilometre Ardennes rollercoaster of Spa-Francorchamps, Hamiltons team-mate, Adrian Sutil (ASM F3, Dallara-Mercedes), finished second, thus securing the ASM teams third one-two in the season with Lucas di Grassi (Manor Motorsport, Dallara-Mercedes) taking third place. In the first lap, Lewis Hamilton performed a sensational overtaking manoeuvre to pass his team-mate, Adrian Sutil, in Eau Rouge for the lead. Afterwards, the ASM pairing opened a massive gap on the field, while their closest chasers spun together off the track. At the end of the long Blanchiment straight, Esteban Guerrieri (Team Midland Euroseries, Dallara-Toyota) and Giedo van der Garde (Team Rosberg, Dallara-Opel) were just too fast and spun, thus losing a lot of ground and opening Lucas di Grassi the chance of moving up to third place and taking a podium finish. Japanese Kohei Hirate (Team Rosberg, Dallara-Opel) clinched an even better result than yesterday and came fourth, while Belgian Greg Franchi (Prema Powerteam, Dallara-Opel) finished seventh, thus scoring his first Formula 3 Euro Series points ever, in his home race, at Spa-Francorchamps.